Wow !!! September was an exciting month for me with my first mega Blogging Marathon, that is blogging continuously for the whole month except on Sundays . I restarted active blogging since March this year and every month I try to do few posts based on my schedule. For the month of September I accepted the challenge of doing this Mega BM. A bit tough with office, home, kids but I wanted to do it and I am very happy that I finished it on schedule and posted all my recipes on time. And as you all know, I choose – A to Z International Flatbreads, i.e. 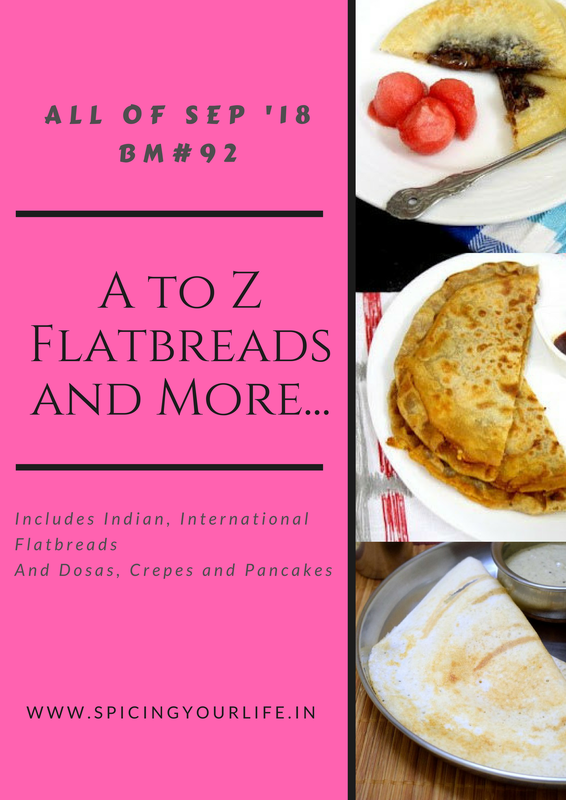 Flatbreads starting with a letter for each day and contain only one Indian Flatbread, limiting the country names or adjectives as prefix . I love exploring new recipes and cuisines, so I decided to opt for the International Flatbread series and I thoroughly enjoyed every bit of this challenge. I got to know so many different types of cuisines, so many different flatbread’s, some healthy and some a treat – sure to leave you wanting for more. In many ways I found that the food in different countries relate or are similar to each other but yet so different. The method of cooking, the way the vegetables are incorporated and the way the bread is cooked makes a lot of difference in texture, taste and appearance. I shuffled the list many times before deciding on a dish. Specially with the difficult letters, I kept on holding till the last moment, as I wanted to use the proper names. I remember for the letter A, first I had decided Arepa, but had to shuffle just 2 days before the start of the Marathon. I started with the first 2 breads in June , had a brief pause and only restarted again in Mid August. Due to time and office constraints, we were eating 3 breads at times on weekend’s and Friday 🙂 and made some quick breads on weekdays too. All in all to summarize, I loved the series and I now have a collection of 26 new recipes and much more, which I could not prepare as had to do only 26, but yes, it will be coming slowly. I would like to Thank Srivalli from Spice your Life for coming up with this theme and my blogger friends who worked as a team and encouraged each other, then my friends and readers of my blog who were with me in this journey. And lastly a big thank you to my DH & Kids who experimented all my breads without which it would have not been possible. Hoping to have many more of such series. Such a fantastic array of dishes and a beautiful roundup. So glad you finished your first mega marathon with such delightful dishes. Kudos to you!! Looking forward to many more such marathons with you. Was lovely doing this marathon with you! Thank you dear, yes I enjoyed it thoroughly. So delicious!! I want an arepa ♥ hehe Pinned! Mega BM are challenging and fun . I am very passionate about them , they show the creative side of you . Kudos on your first one , I can assure you , you will be hooked on . Choosing international Flatbreads is a tough theme but you did with such ease , loved all your posts and have bookmarked this post as this is the one stop read ! Awesome , keep rocking . Fantastic series Renu. You have really worked so hard to get the apt dish for each letter. A wonderful collection which I am sure will be so useful. I have bookmarked some that I haven’t tried. What you said about eating 3 bread over the weekend was what happened in my case too..but we did it! All the international flatbreads that you chose are so nice Renu.Some of them so unique and that too from countries I haven’t even heard of! I have bookmarked quite a few flatbreads to try out. And as for this marathon, I did a cooking marathon to complete the posts,with many of them being cooked ,clicked and posted on the same day! Anyway, it was fun doing this mega BM with you. Renu, first of all congratulations on completing your first Mega BM without any delay in posts. It requires so much dedication and you’ve managed to do that with all the other responsibilities. Love your collection of International flatbreads, have bookmarked quite a few. wow such a beautiful journey came to an end. Loved running with all of you. Got to know more a little about you via stories. You made a great effort in making International breads. Congratulations on completing the first mega marathon! Each and every flatbread of yours was unique and amazing and it was lot of fun doing this with you! That is a great compilation of the international breads, Renu. It is tough for me to think about international breads but you have executed it with beautiful recipes. Hats of to you! Tremendous compilation and many delicious breads to give a try without any fail. Enjoyed going through all your posts during this whole month of september. Renu seriously you rocked. Wow! An impressive array of breads. So many to choose from and I so much enjoy making flatbreads. What a great collection. I LOVE bread, especially homemade bread. I have never tried making flatbread at home. After looking at this list, I don’t know which one I want to try first. My goodness, what an incredible post and project! I love bread, it’s one of my all time favorite comfort food. And all these looked amazing! I tried injera for the first time this Fall, and I loved it! Also fun seeing Swedish knäckebröd, they are the same here in Norway too, although we call them knekkebrød. Thank you so much for sharing, I know I couldn’t post 26 posts in 30 days, so very well done! What a great project! I love each and every of these recipes and will need to try them all! Congratulations! What a fabulous project! I’m not sure I could manage 26 recipes in a month! I love the look of these flatbreads and am dying to try some! What an amazing resource! These all look so delicious. I’m having a hard time figuring out where I want to start because everything looks so good! Congrats on your blogging marathon – that is a great achievement! And I imagine how tough it was with all the things that we all need to do here and there – well done! Oh, and your flatbreads look amazing! What a beautiful collection of flatbread recipes. This must have taken a lokg time to compile. I will pin this for later reference. Thank you for sharing. What a great collection of flatbreads. I’ll be bookmarking this page for future reference. what a collection!! I’ve only tried a few of these but I think that Bostwana one is calling my name to try next!